ADD: Map Coordinates – on click are now copied to clipboard. FIX: Some minor bugs removed. CHANGE: When option “share” is chosen during the export, now user is shown possible option every time. ADD: Possibility to exclude attribute when “Last added as default” is selected in Survey Settings. If this option is enabled for the attribute the form field is populated with default value or left blank. ADD: Possibility to set default value for a particular value in drop-down list. FIX: Tracking on Android 8.1 and 9. CHANGE: Navigation, now distance is calculated and displayed even when bearing to destination is not yet available. CHANGE: Improvements in NMEA parsing for external GNSS devices. CHANGE: Now accuracy is set as 1-sigma RMS when available. HRMS is 2-sigma RMS. 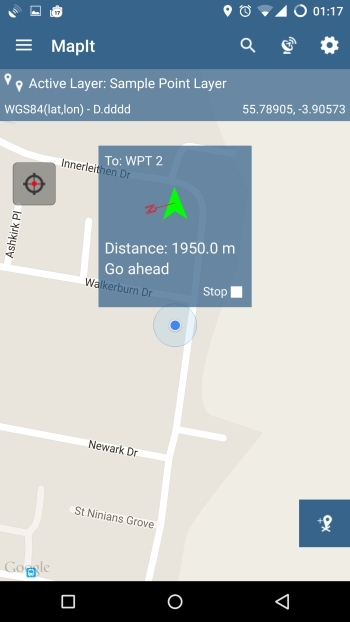 FIX: Improved zoom to latitude, longitude using Search widget. On some occasions the search was not accurate enough. FIX: Users using devices with Android 9 were not able to start GPS tracking. HOTFIX: Users running Mapit on Android 9 (Pie) devices were experiencing problems after last (6.9.9) update. Now resolved. FIX: Position averaging for lines and polygons. ADD: Added option to display accuracy & GPS quality on the map Survey Settings-> Accuracy & GPS Quality on the Map. CHANGE: Change: Now averaging works independently from minimum accuracy if required and averaged position is calculated over specified time. The averaging time can be set between 1 second and 10 minutes. FIX: Minor bug fixes reported by users. FIX: Problem with Export to PostgreSQL when attribute name or attribute value contained ” or ‘ character. FIX: On some devices there was a problem with saving feature when vertex was moved or removed manually during tracking. 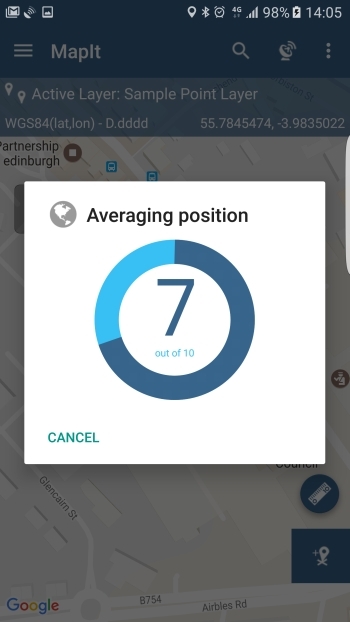 FIX: Position quality was always displayed as GPS even though e.g. RTK-Float was used. CHANGE: When HRMS is available from external GNSS – it is now always used to set location accuracy. 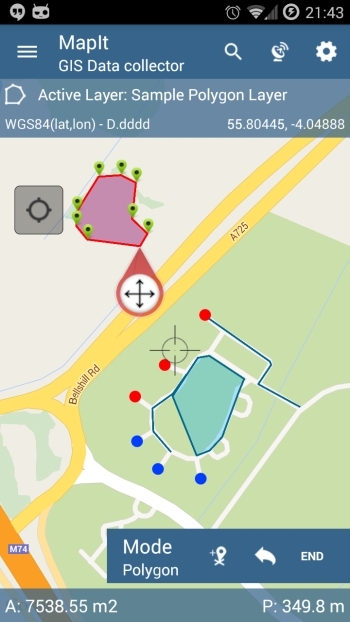 CHANGE: SXblue GNSS receivers are now supported when latest SXblue ToolBox application is set as Mock Location Provider. FIX: GPX export time stamp now allows import to Openstreetmap. FIX: Search widget was not working as expected after recent Nominatim Service changes. 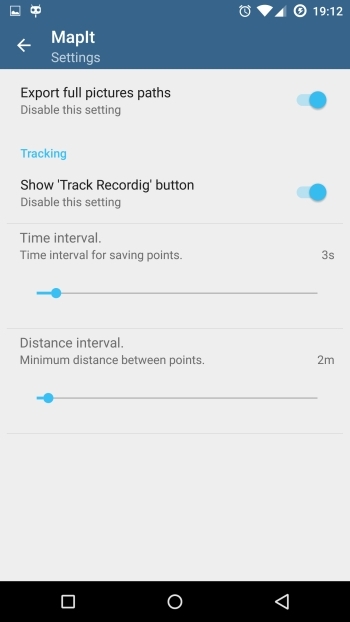 FIX: Tracking on Android Oreo when application is running in the background. FIX: MGRS coordinates – for even numbered zones Northing square letter was not correct. CHANGE: Minor changes to Navigation behaviour. CHANGE: The app should now work properly with Lefebure NTRIP Client when it’s set as a mock location provider. ADD: Export – Possibility to export data to PostgreSQL database. CHANGE: Project Point Method – baseLat, baseLon, baseElev, tgtHorizontalDistance, tgtBearing, tgtSlopeDistance, tgtVertAngle fields can be now added to the export. Please enable in Survey Settings->Export range finder measurement details. CHANGE: Project Point Method – if slope value is available from HV (Horizontal Vector) message. The elevation of the projected point is calculated using trigonometric functions. ADD: Full support for DATAGNSS receiver. 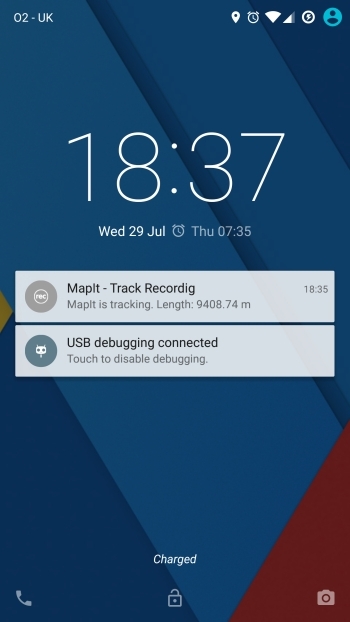 (More information about this receiver is available on rtklibexplorer site) – Mapit do recognise D302-RTK receiver and if the RTK Service is running on the device the high precision position is automatically being applied. FIX: Minor bugs have been identified with tracking after last update – now fixed. FIX: Export to shapefile was not working as expected on some occasion when barcode field was used on the form. FIX: Other minor bugs removed. CHANGE: External GNSS via Bluetooth or TCP Port does not require any more Developer Mock Location Settings. CHANGE: Possibility to choose if pictures are removed or not during when “Clear Layer” option is used. You can change default behaviour in Miscellaneous Settings. CHANGE: Some minor changes related to Mapit NTRIP Client implementation. FIX: In 5.9.2 version – on some occasions the altitude was not saved correctly. FIX: CSV Import – files were not loaded properly if the name of the fields in first row were not enclosed in quotes. FIX: Some users reported problems with Trimble Mobile Manager and Catalyst Antenna. Now resolved. CHANGE: Better handling of accuracy for devices getting SBAS corrections. CHANGE: WMS – Some 1.3.0 services were not showing layers as expected. CHANGE: Zoom level is now maintained when switching between ‘Center on GPS’ and ‘Map Cursor’ mode. 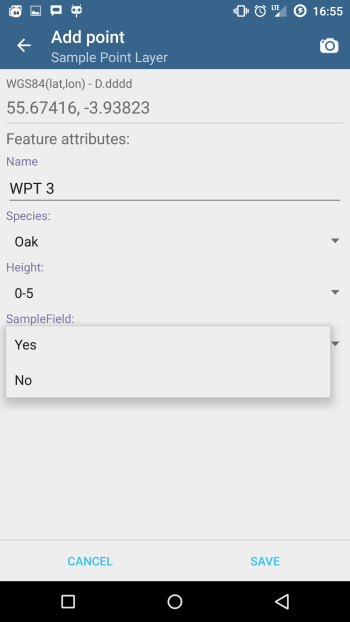 ADD: Option to add multi selection field to the form. ADD: Possibility to set the field as ‘Required’. ADD: Added support for Simplified Chinese. CHANGE: WMS – Multiple selection allowed. CHANGE: WMS, ESRI, Other Services – Transparency can be set for each service separately now. CHANGE: WMS, WFS – Drawing order can be now changed. FIX: WFS management – dark theme was not rendered properly. 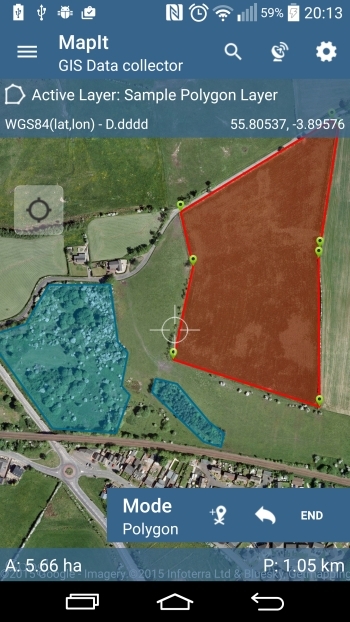 ADD: Possibility to use Mock Location provided by Trimble TMM connected to e.g. Trimble Catalyst antenna. ADD: Basic WFS implementation. Now WFS layers can be displayed as Google Maps overlays. 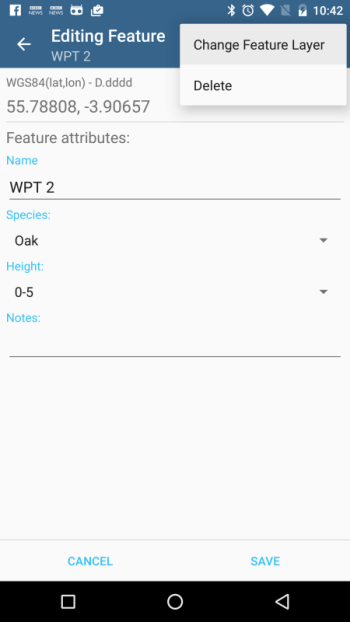 FIX: WMS version 1.3.0 – removed bug. FIX: Since version 5.8.1 Altitude and Speed Panel was not shown when activated. Now fixed. FIX: Edit Point Geometry – not able to save new position if projected coordinate system was selected. 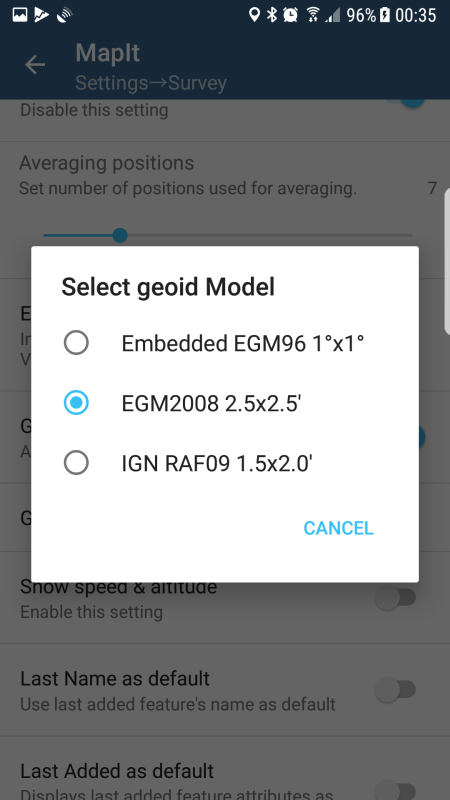 FIX: Minor improvements to External GNSS connection over Bluetooth. 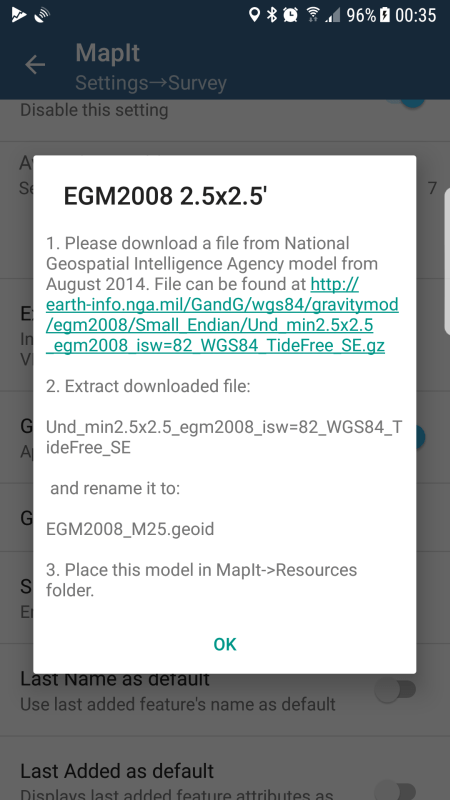 ADD: Support for custom Geoid grids in *bin (US National Geodetic Survey format) – convert your local grid to *bin format and rename to LOCAL_GEOID.bin then place in Mapit->Resources folder. You can download the local geoid grid e.g. from https://www.eye4software.com/hydromagic/documentation/geoid-models/ and convert to the *bin format using Geoid File Conversion Utility . More info on Orthometric Height. 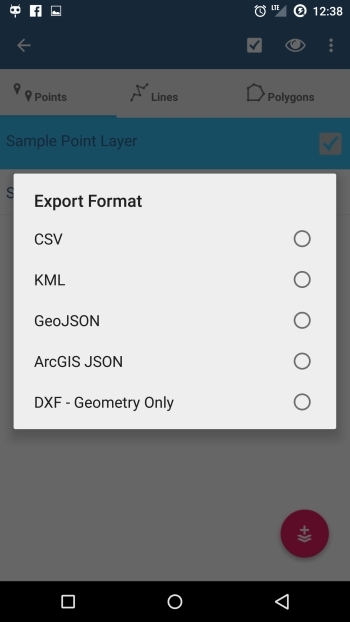 CHANGE: Geoid Height is now included in POINT layers export when GNSS stats are enabled for export. CHANGE: GPS Info screen now displays geoid used and applied geoid height. ADD: HT 2.0 Geoid Grid support for Canada. ADD: Geoid grid support for Slovenia. FIX: Bug removed. On some devices there was a problem related to editing of existing Lines and Polygons. FIX: Resolved problem with drawing labels when label text was empty. FIX: Export to CSV – when local coordinate system used the projected coordinates were missing in POINT export. 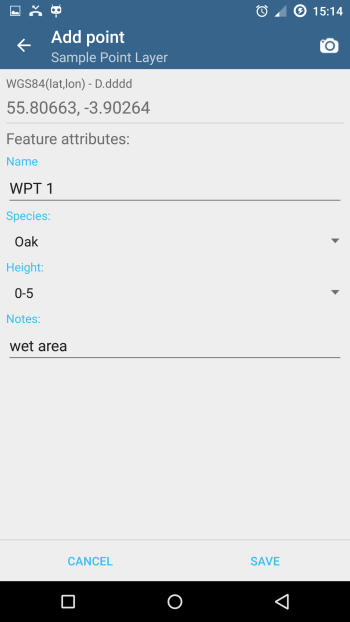 FIX: Location coordinates not properly displayed when WGS84 decimal minutes format used. 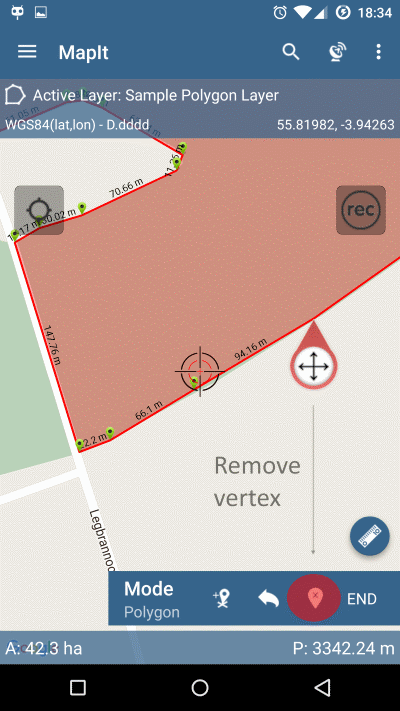 FIX: Users using custom coordinate system experienced problems with the app after 5.7.3 update. Now fixed. CHANGE: Enabled Firebase Crashlytics reporting. 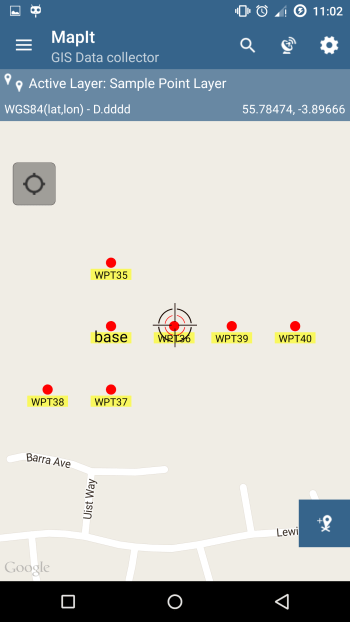 ADD: Possibility to use applications like EOS Connect (Arrows receivers) and Leica Zeno Connect (Leica Smart Antennas) as a source for accurate (RTK corrected) location in MapIt. FIX: Removed bug related to shape file export – on some occasions during the export of layers containing attributes of type Boolean the app was crashing. 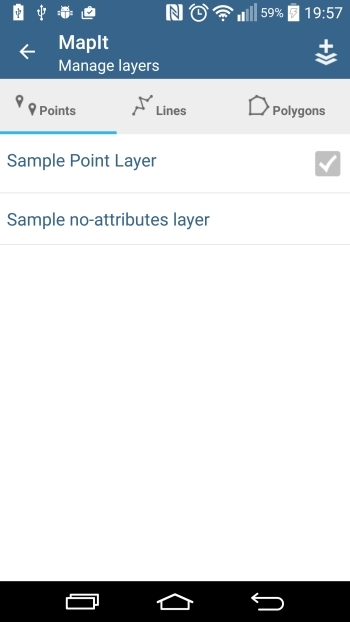 FIX: “Clear layer” for point layers is now fixed and working as expected. 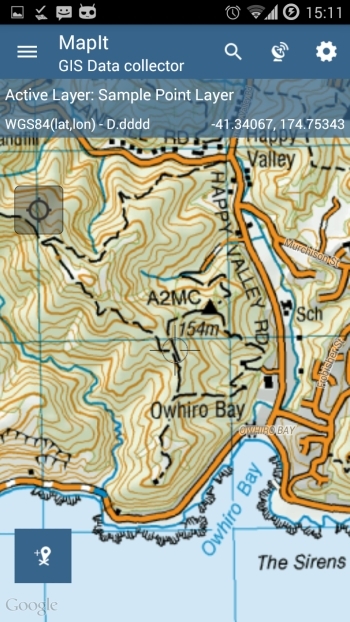 CHANGE: Improved rendering for online maps (Openstreetmap, Bing, WMS, Mapbox). CHANGE: Improved rendering for offline (mbtiles) maps. CHANGE: Point layers created in Mapit now are exported as POINT geometry type instead of MULTIPOINT. CHANGE: Numeric fields are now exported as numbers. CHANGE: Improved UTF-8 encoding for diacritic characters. 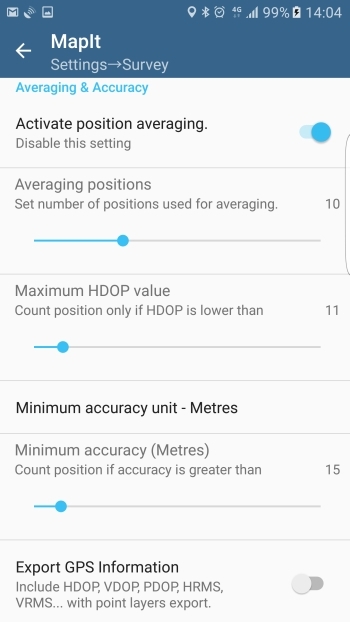 CHANGE: Removed HDOP from minimum accuracy settings. CHANGE: Changes to navigation function. FIX: Other minor bugs removal. CHANGE: Navigation Panel now has 2 decimal places for distance. CHANGE: Web Mercator Auxiliary Sphere (EPSG: 5387) is now supported in terms of import from SHP file and geojson. 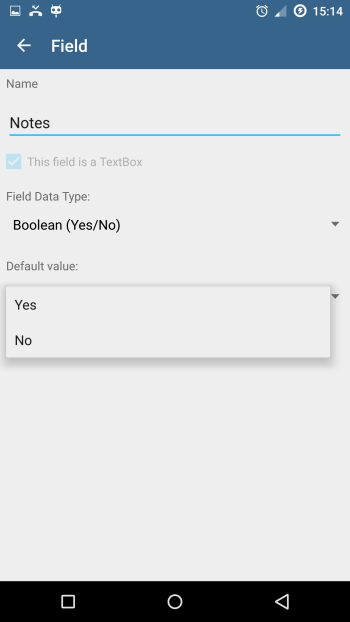 FIX: Issue with Attribute Set export – for Android 7 users. FIX: Few minor bugs removed. CHANGE: When swaping features between the layers if the attribute set is the same the values will be maintained. ADD: Possibility to set backup file name when the new backup is being created. This allows possibility to create backup as kind of separate projects – you can swap between. FIX: When “Last Added as Default” was selected and NUMERIC field was presented on the form the app was crashing. This bug is now removed. CHANGE: Navigate to feature. Now selected linear unit is applied and the distance is automatically converted to e.g. yards, km, miles. FIX: Crash during the import from shape file on lower spec devices when larger file was imported. Now fixed. FIX: Numeric fields in the form were exported as text e.g. in the exported geojson file. 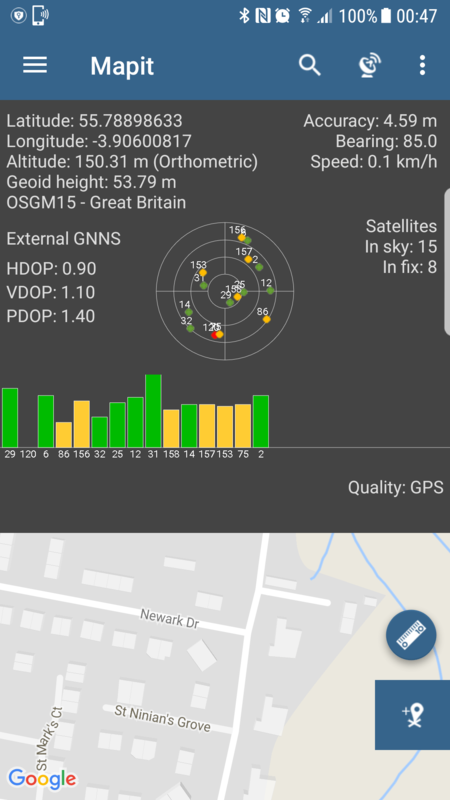 FIX: After last update on some devices there was a problem with exporting GNSS stats or they were inconsistent. Now Fixed. FIX: Related to change in target API with previous update. Users using devices with Android 7 and Higher were not able to add picture attachments during the ADD/EDIT Feature operation. Now fixed. 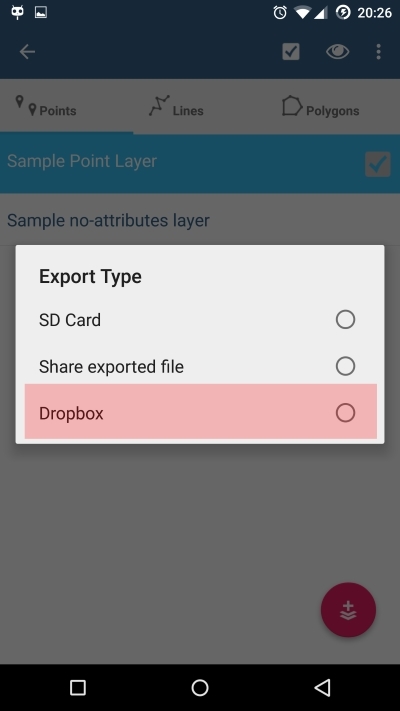 FIX: Removed problems related to export attach file operation and other share operations for Android 7 and higher. CHANGE: Improved Czech translation. Some language specific characters were not properly displayed. CHANGE: From this version only MapIt Pro Extension can be acquired. Users using existing extensions will not be affected by the change. FIX: The ‘Navigate to Feature’ facility stopped working after last update. Now the problem is resolved. 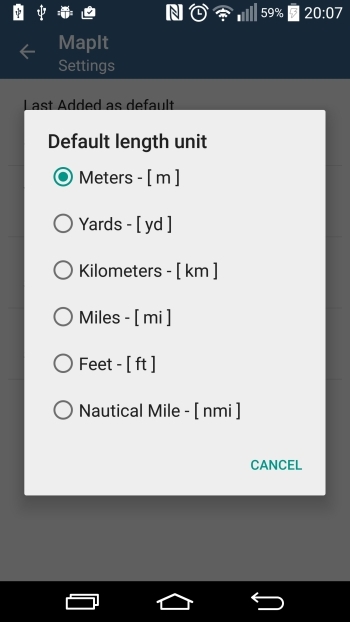 ADD: Possibility to enter GPS antenna height in Survey Settings. 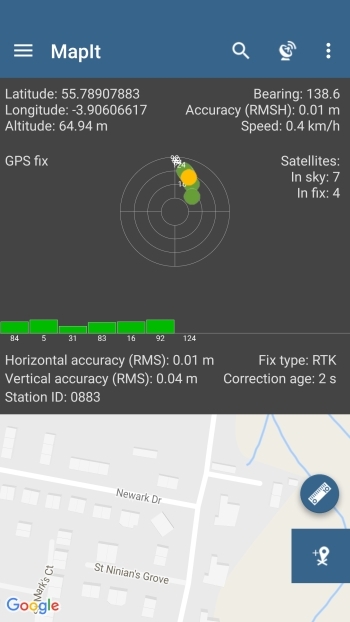 FIX: Resolved problem with the GPS Satellites position and signal for some external GNSS systems – Many thanks to beta testers for providing NMEA logs. FIX: Some problems related to GPS Info were identified on Trimble TDC handheld – now fixed. FIX: Few other minor bugs removed. FIX: SHP file export – problem with “full path to pictures” field. CHANGE: Added better support for RTK corrected coordinates. 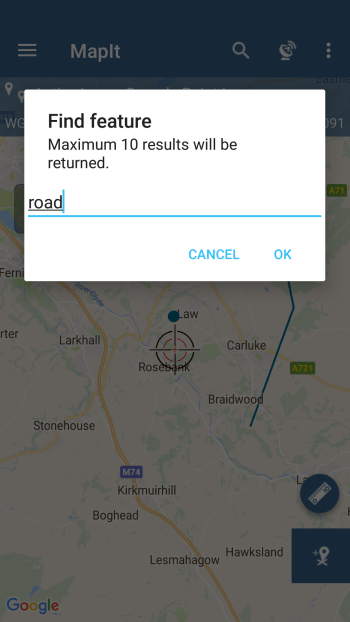 If external GPS device is capable of streaming RTK corrected NMEA sentences additional information is displayed in GPSInfo screen. 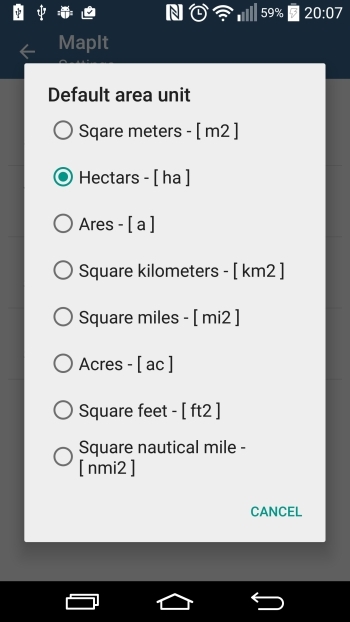 Additional GPS info fields can be included in export for Point Layers. FIX: Import from SHP file, some UTF-8 characters in DBF file were causing the app crashing during import. CHANGE: Maximum number of polygon and line features has been limited to 1000 per layer when importing from files. ADD: Added ‘Feature Properties’ screen, displays track or polygon stats and displays elevation profile if hight data is available. 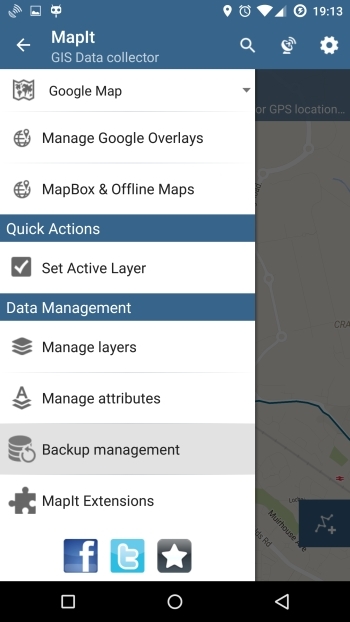 CHANGE: If offline map or WMS or ArcGIS Server Tiled service is being used this is now indicated in the navigation drawer. CHANGE: Number of features is now displayed next to the layer name. 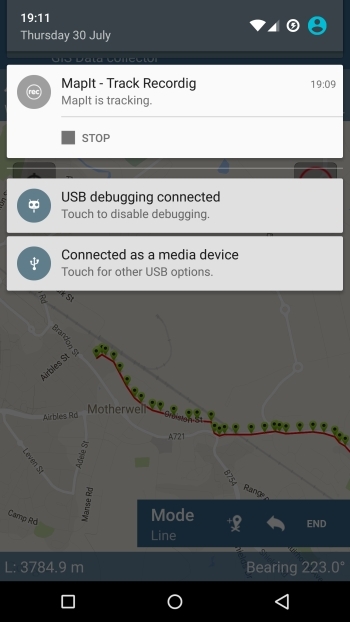 CHANGE: GPS info window can now be closed using swipe-up or by pressing the ‘back’ key. CHANGE: Possibility to zoom to the extent of the selected offline map. FIX: Export to CSV. In some circumstances affected fields were not properly exported and missing in output file. CHANGE: Improved “swap active layer” action. 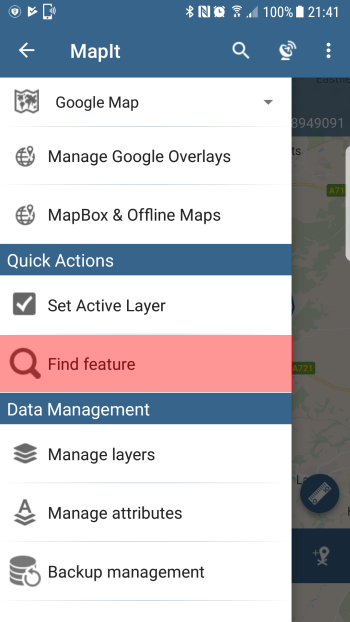 Now active layer can be set by clicking the layer name on the map. FIX: OfflineMaps – App was crushing when OfflineMaps folder was empty. 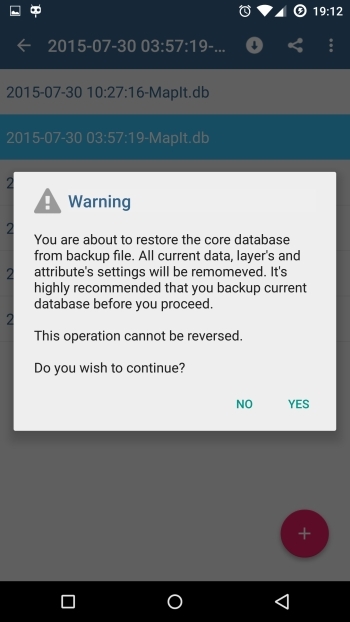 NEW: Possibility to read mbtiles from removable SD Card. 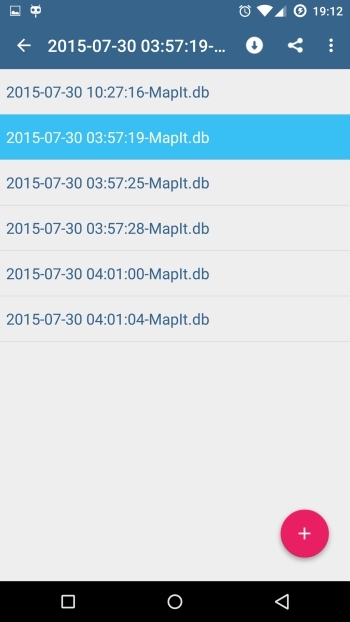 Put your files to removable SD Card->MapIt->OfflineMaps. NEW: Possibility to import from ArcJSON (Esri) format. 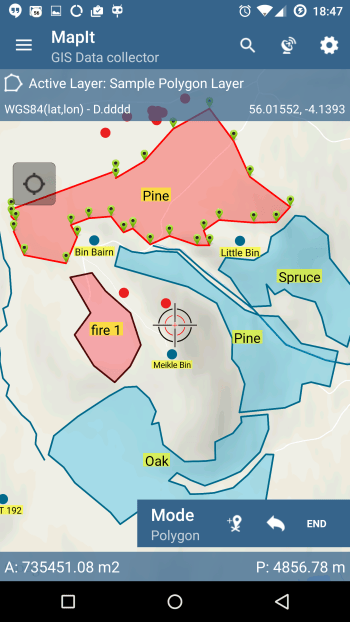 NEW: Last selected base map is now restored on app re-start. CHANGE: Show Layer’s features icon – now is always visible. 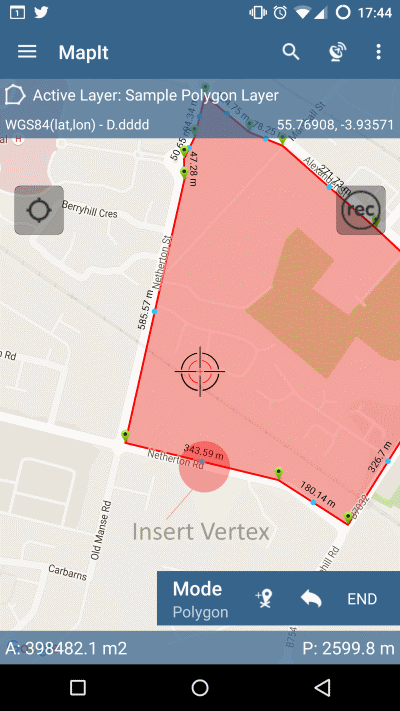 FIX: Zoom to feature when GPS location was enabled. FIX: Users with redeem codes were experiencing some problems. 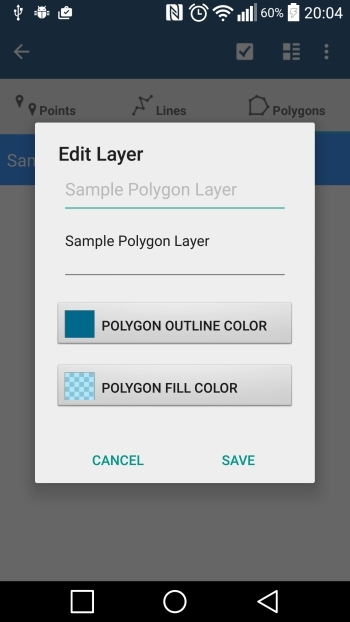 CHANGE: When creating new layer the default geometry type reflects actual layer type tab. CHANGE: Improved Turkish and Polish translation. FIX: CSV Export (Points) was broken when not projected coordinate system was selected e.g. WGS84 (lat,lon). Now the problem has been rectified. ADD: Possibility to set EPSG code for local coordinates conversions. See website for more details. FIX: Some users were having problems with using large forms’ definition containing more than 100 fields. New features were not created. Now limitation of 100 fields has been taken out. ADD: Option to pair external GPS device and use it as location source. 1. Make sure the device is paired in Bluetooth settings. 3. 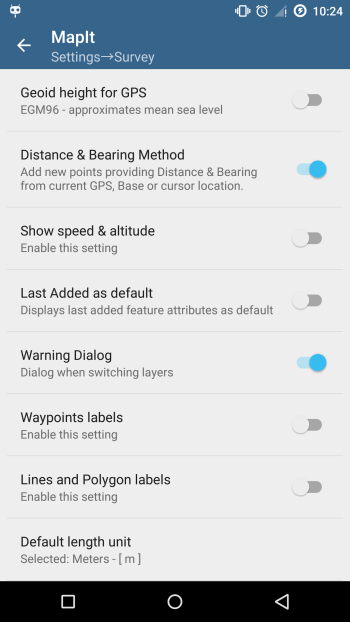 In MapIt settings go to External GPS and switch ON the External GPS switch. 4. When getting back to map the location source will be automatically switched to External GPS (you may need to restart app on some devices). ADD: Possibility to enable tracking for point layers (please go to miscellaneous settings and scroll down to the tracking section to enable this feature). HOT-FIX: Some users were having problem with adding new features and editing attributes after last update – this should be rectified by this update. ADD: Possibility to move features (point, line, polygon) to another layer. 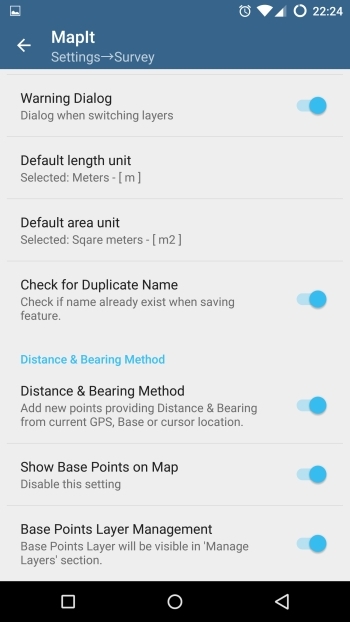 CHANGE: Added support for Mock Locations (some remote GPS receivers require this option to work properly). FIX: Removed issues with the drop-down lists background on ‘Edit Feature’ screen. FIX: Some problems connected to import from CSV and geoJSON from Dropbox platform. CHANGE: Improved German, Indonesian, Spanish & Portuguese translations for recent MapIt changes. ADD: Possibility to use Bluetooth enabled laser rangefinders as a source for “Distance & Bearing” method for adding points and vertices. FIX: Minor bug fix – some users with older Android system experienced problems when adding new Google overlays. FIX: Problem with import from file caused by last update has been fixed. FIX: Some users with Android 4.4 and lower reported problems with the app after last update. ADD: Option to enable “intermediate distances” for measurements, line and polygon features when in ‘Edit’ mode. Can be enabled in “Miscellaneous settings”. 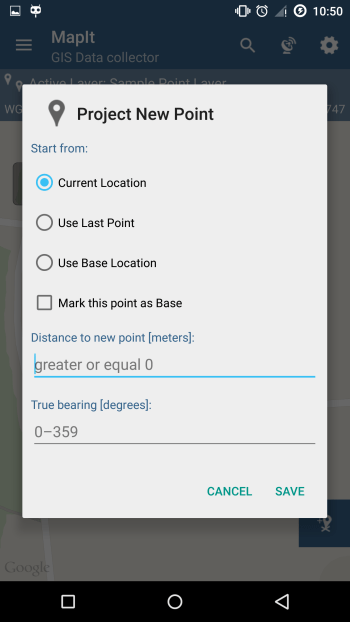 CHANGE: When using “distance & bearing” method for adding points if value for distance and bearing is blank then 0 is being used as a default. FIX: Minor bug connected to the last update and the database upgrade. FIX: Import – when dark theme was selected the list containing files to import was not styled properly. FIX: Map rotation. The map was rotated back to north after ‘Add feature’ operation. FIX: General settings – line & outline size problem. FIX: Problem with zoom to feature in some circumstances. FIX: Fixed issue with ‘zoom to last extent’ when the app starts. CHANGE: Moved units & coordinates setting to separate category. FIX: Navigation. On some devices ‘Stop Navigation’ was not working as expected. FIX: Minor bug related to the export. FIX: Navigation. When destination feature was removed the app could not start after restart. Now navigation is stopped when feature you are navigating to is removed. 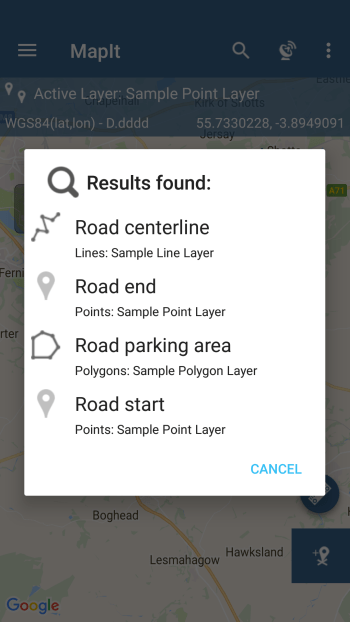 ADD: Possibility to export Point Layers to TomTom OV2 format. CHANGE: Some changes has been applied to the export module – please contact us by email if you spot any problems. 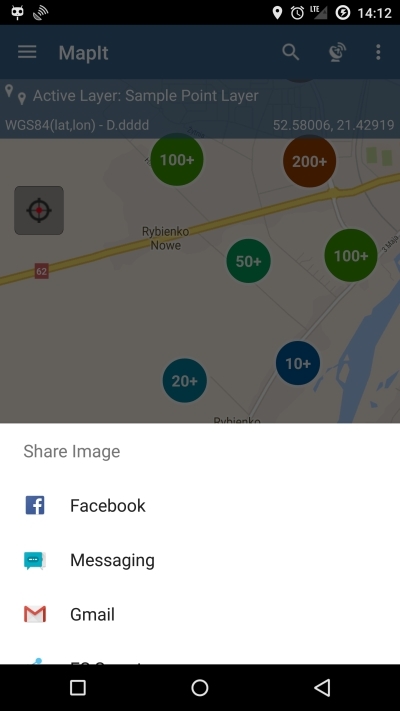 FIX: Users using offline maps were getting error when they removed active mbtiles file from SD Card before removing it in MapIt. FIX: Some minor bugs related to the export to CSV and Base Points Layer has been fixed. FIX: Issue with the layer visibility icon. 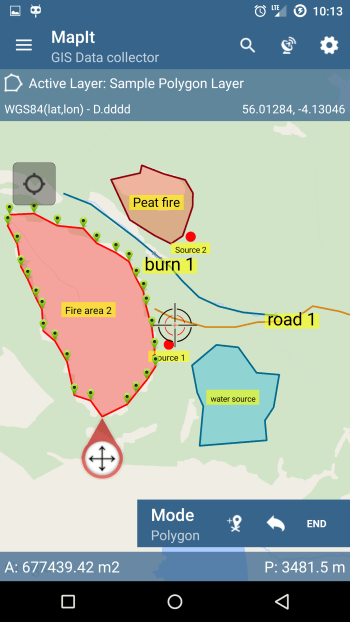 CHANGE: Slightly changed export to KML and GeoJSON – now line or polygon stats (perimeter, distance, area, units, number of points) are included as separate properties, so e.g. 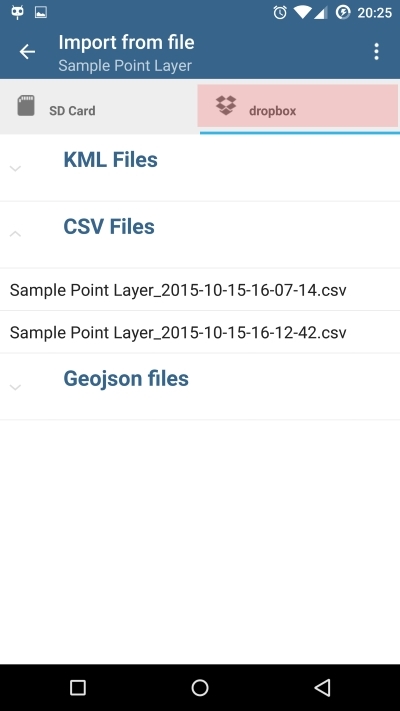 when GeoJSON is converted to SHP file these properties becomes a separate fields. ADD: Navigate to feature. Edit feature and press ‘Navigate’ button on the toolbar. FIX: Issue with edit point and add picture function. 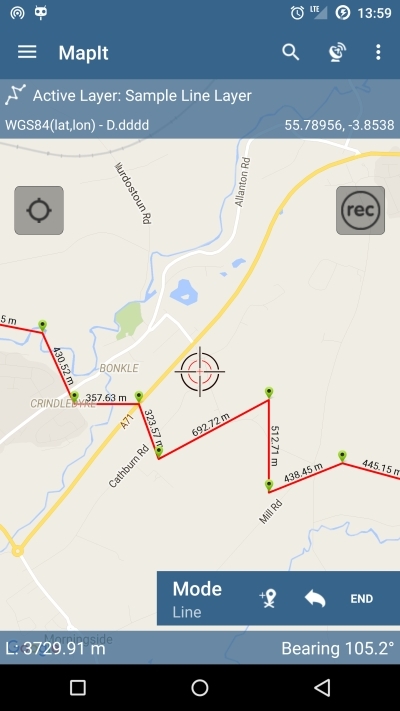 FIX: Issue with coordinates being displayed when map scrolled and no GPS signal. FIX: Zoom controls were obstructed when Rec button was visible. FIX: Map rotation – when stopped map is rotated back to north on top. 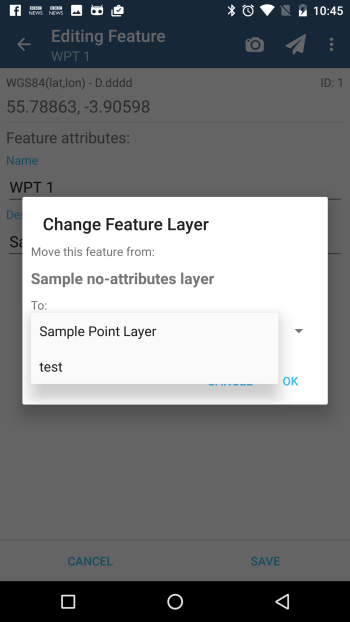 FIX: Bug caused by update 3.3.0 – features were not properly listed for layers not having attribute set. 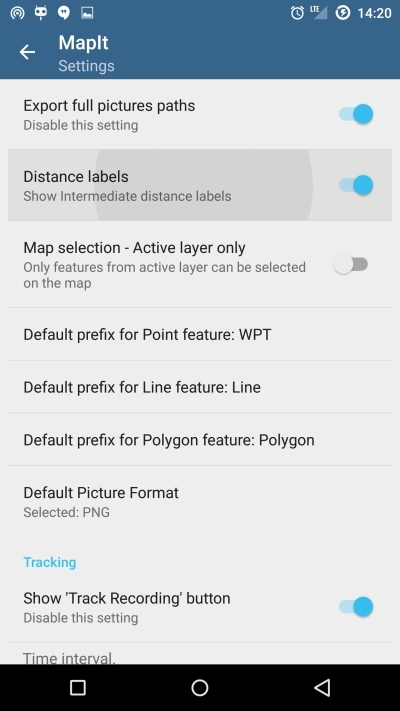 ADD: Possibility to limit map selection only to active layer features (Miscellaneous Settings). ADD: Possibility to add OSM (OpenStreetMap) type services. 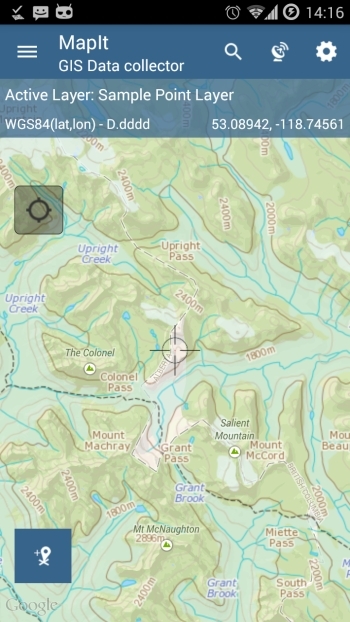 CHANGE: Improved ‘ZoomTo Feature’ function – now the map is zoomed to the feature extent. 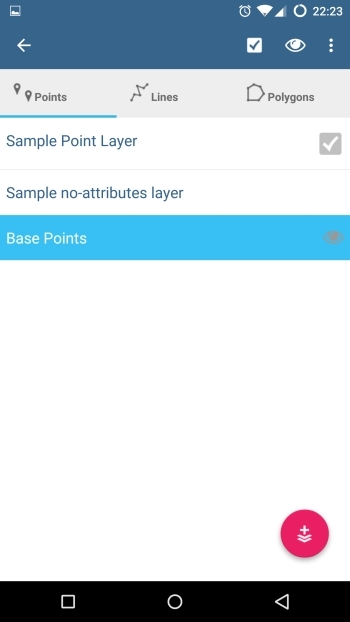 FIX: Removed possibility to Delete a Base Point Layer. Users who removed the layer could not use the ‘Bearing & Distance’ method for adding new points. ADD: Support for Lambert-93 (France) projection. ADD: Possibility to set default prefix for new features in miscellaneous settings. CHANGE: When creating new layer some special characters within the layer name like: /\’:*?”|<>.,;+ will be replaced with _ character. CHANGE: Moved compass below the ‘Centre on GPS’ button when map rotation is used. FIX: On some devices users could not use backup management because of ‘:’ character in the file name. ADD: Added support for Indonesian language. ADD: Possibility to add multiple bases for ‘Distance & Bearing’ method. 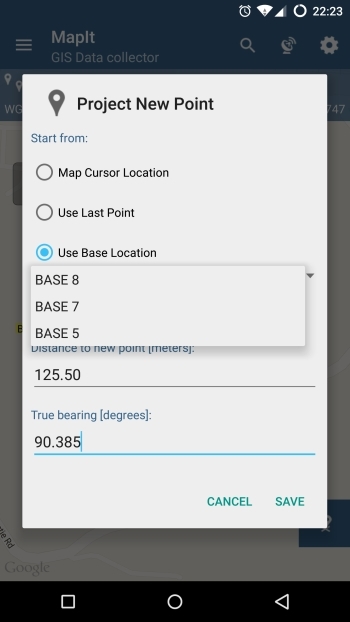 ADD: Option to show on the map and manage base points for for ‘Distance & Bearing’ method – (Survey Settings). Base Points – Layer visible in ‘Manage Layers’ section. 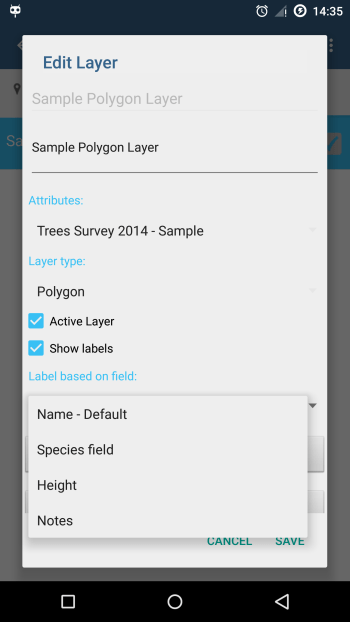 ADD: Option to show description field for layers using attribute set – (Survey Settings). ADD: Option to use last name as default – (Survey Settings). ADD: Option to check for duplicate names when adding new feature – (Survey Settings). 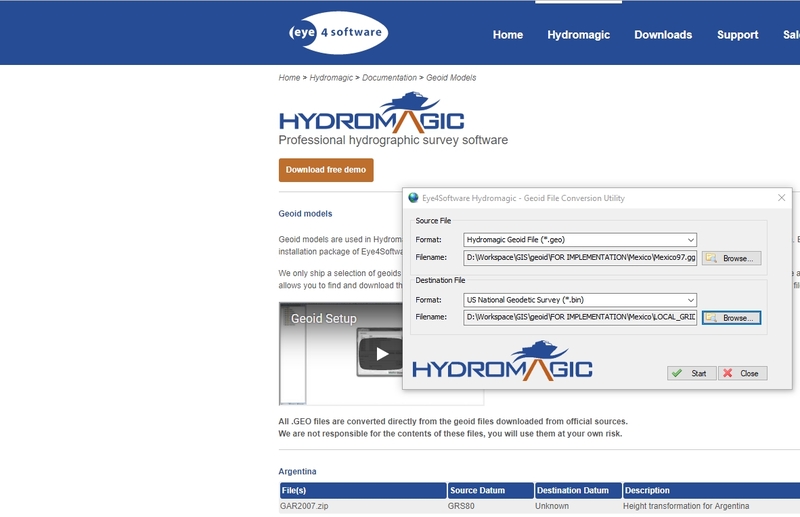 FIX: In ‘Project Point’ method users could not input decimal values into the bearing field. 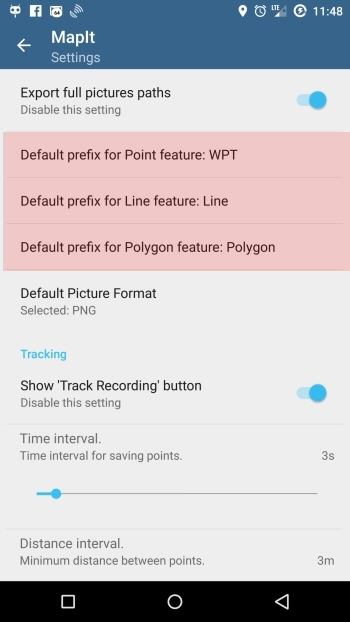 FIX: For Line feature tracking notification – the total length was not updated properly. FIX: Users having layers with names containing some special characters like / \’ had problems exporting the data. 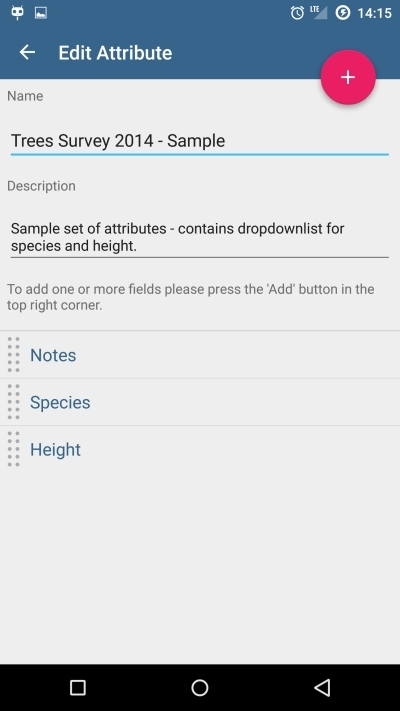 ADD: Option to label features using field value. Please edit layer to choose label’s field. ADD: Possibility to show/hide labels for each layer separately. Please edit layer to enable or disable labelling. 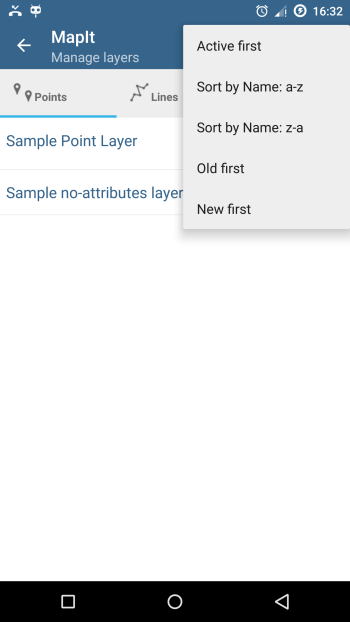 CHANGE: Modified add/edit layer dialog. 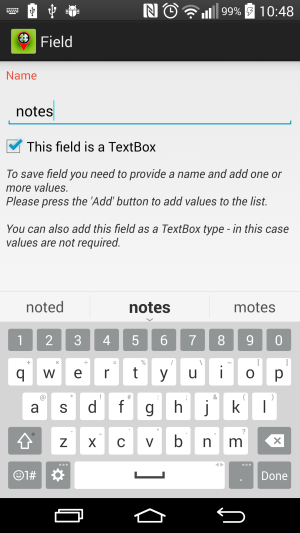 ADD: Possibility to set default value for a text field. FIX: For function ‘Last added as default’ caused by update 2.8.7. FIX: For add point using Bearing & Distance method. 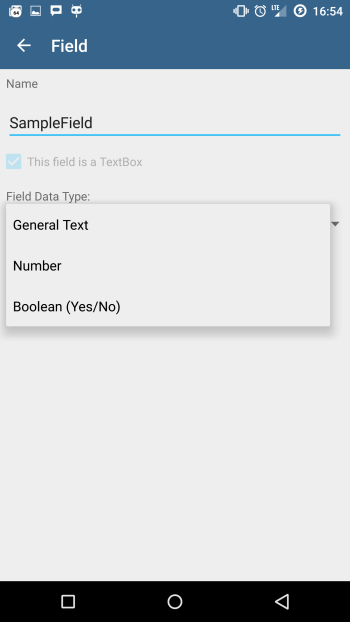 ADD: Possibility to set a field type for attributes as number or boolean in addition to general text. 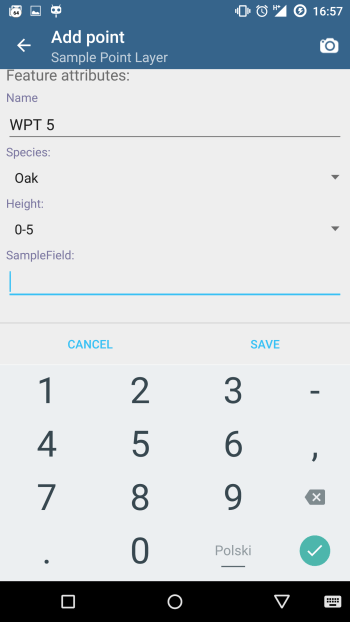 When adding new point or feature the input keyboard will be changed to number (for numeric fields) or drop-down list with values YES/NO (for boolean fields) will be displayed. 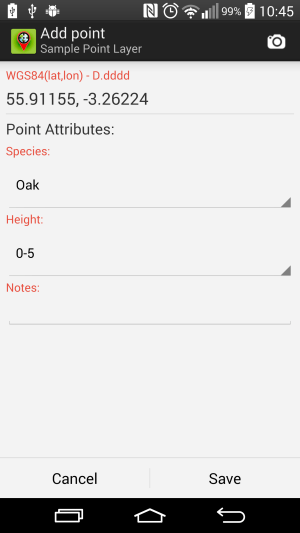 -Implemented new method for adding points (Bearing & Distance) – can be enabled in Survey Settings. ADD: Added option to clear layer – this option is removing all features from the layer, but not the layer itself. – Fixed issue with the point not being removed from the map after delete operation. ADD: Possibility to remove selected picture from the app. ADD: Added information about number of pictures for selected feature as Gallery subtitle. ADD: Added possibility to select dark theme in General Settings, useful in direct sun and to spare some energy. ADD: Geoid Height Extension (To enable go to Survey settings) – allows to record height above EGM96 geoid which approximates mean sea level. ADD: Possibility to display current altitude and speed on the map. ADD: Possibility to drag waypoints – long press the waypoint to activate the drag mode. CHANGE: Quick action ‘Add layer’ has been replaced with ‘Set Active Layer’ option. CHANGE: Minor changes to the app design. 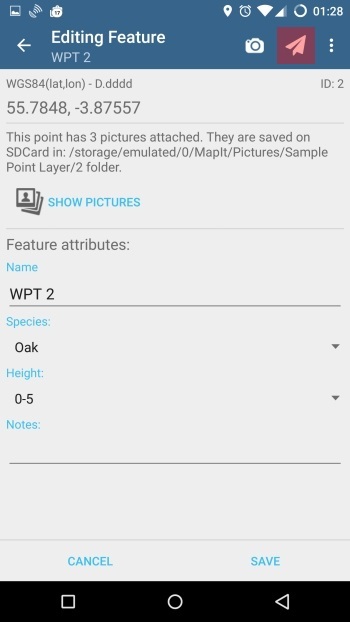 ADD: Added pictures location info to exported files as new properties. FIX: Fixed issue with ‘keep screen on’ function. FIX: If feature was edited the change date is added to the exported files as new property. ADD: Added support for Portuguese language. 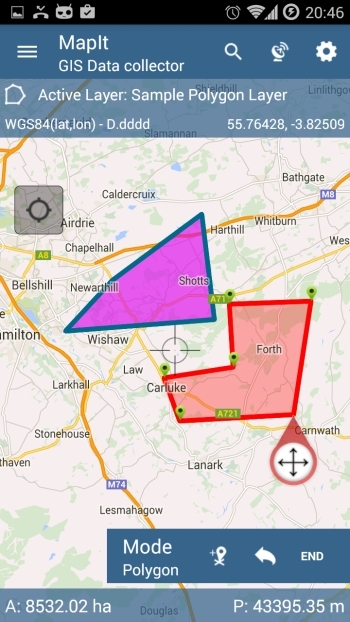 ADD: Now multiple layers can be displayed on the map along with the active layer. ADD: Features’ color and transparency can now be set separately for each layer. FIX: Bug fixes related to features gallery and multiple layers mode. FIX: Minor bug fix related to ‘Active Layer’ not being set. Multiple layers visible along with the active layer. ADD: Possibility to move vertices of existing lines and polygons. Select polygon then press ‘Edit’ button on the toolbar to start editing existing feature. Edit existing feature – single click on vertex to activate “move vertex” mode. ADD: Features’ colour and transparency can now be set separately for each layer. Edit layer to change default colour and transparency. ADD: Introduced “MapIt Pro (All in One)” extension. Get the extension and unlock all MapIt paid features for less. ADD: Added “MapIt Extensions” screen – now you can see status of your purchases in one place. 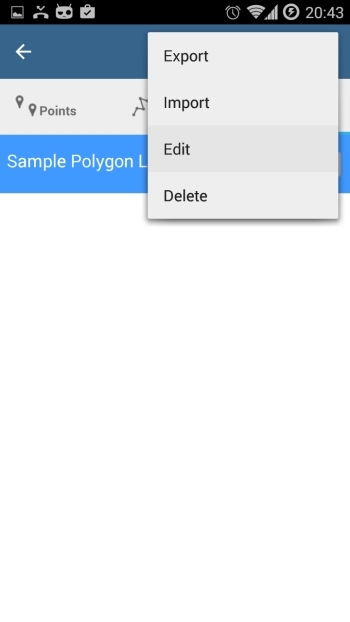 ADD: Possibility to import data into Polygon,Line or Point layers from KML and GeoJSON files. Import from file now available for Polygon and Line features. 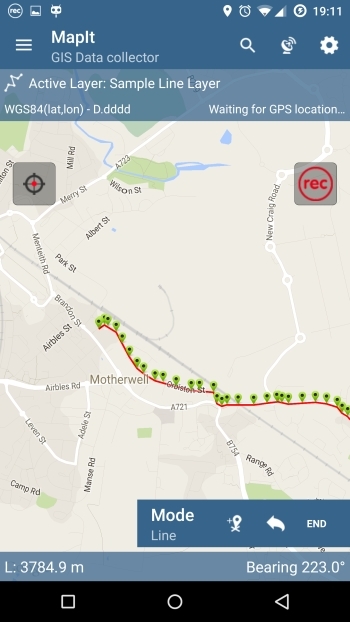 ADD: Added Bing Maps (Standard, Satellite, Hybrid) & Open Street Map layers (Mapnik, Cycle) as standard base maps. FIX: Problem with map not being refreshed when layer was swapped. ADD: Possibility to import attributes’ values from text files – just create a file containing each value in separate line, save it as .txt format and transfer it to SDCard->MapIt->Import->Attributes folder. Attribute’s values imported from file. ADD: Added option to hide dialog window when switching layers. 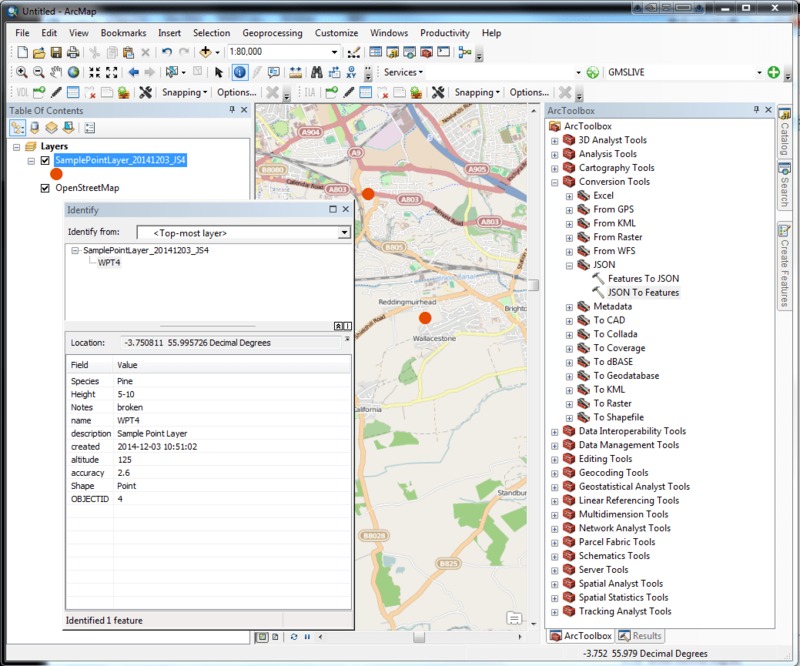 Convert ArcGIS JSON to ArcGIS Features. CHANGE: GPS Info screen has been redesigned. New GPS Info pop-up screen. 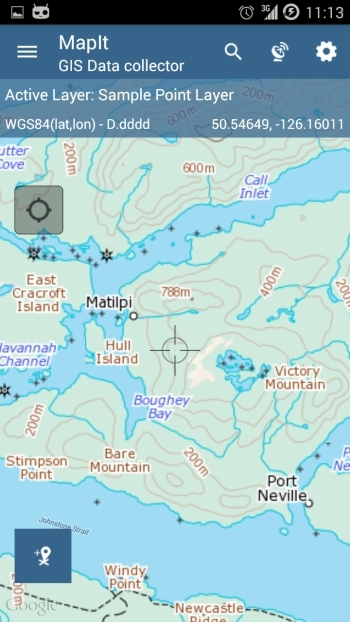 CHANGE: Basemap’s drop-down list has been moved to the navigation drawer area. ADD: Added support for Android 5.0 (lollipop). FIX: Minor bug connected to GeoJSON export has been fixed. ADD: Added support for Spanish language. ADD: Added support for Polish language. ADD: Application published on Google Play. mapitGIS © 2019. All Rights Reserved.